Our range of products include ultrasonic cleaner (lapro). 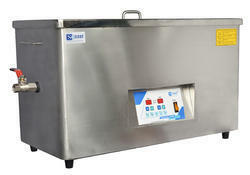 We are engaged in offering Ultrasonic Cleaner (Lapro) that is based on latest moset technology. The super clean ultrasonic technology assures broad spectrum of cleaning. Further, by enhancing the power multiply frequencies, more precise cleaning can be achieved that are environmentally safe. This cleaning method assures removal of contaminants that defy soaking, scrubbing, spraying & other conventional cleaning method. In addition to this, the rapid formation and violent collapse of minute bubbles or cavities in a cleaning liquid is highly effective. The unique penetrating action cleans dirt more effectively and in a faster manner. Looking for Laparoscopic Ultrasonic Cleaners ?